Oh my goodness I'm in love!! Blogging from my phone in the middle of the night while nursing a newborn is the easiest thing ever!! 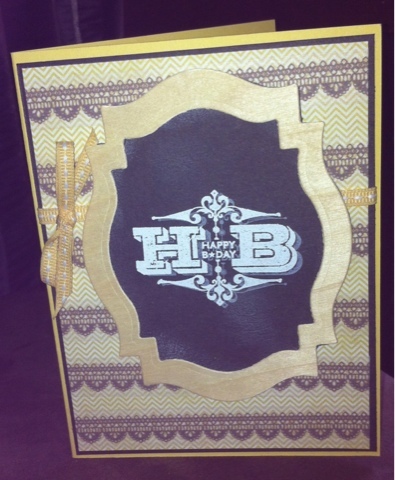 I placed some grey lace washi over the yellow chevron paper- should have placed it closer together now that I look. This is my favourite way of changing pattern paper and I'm going I use it more frequently! I used the blackboard technique and made a little frame with wooden paper from Michaels. Stamp and ribbon is SU. Card stock and ink is PTI.